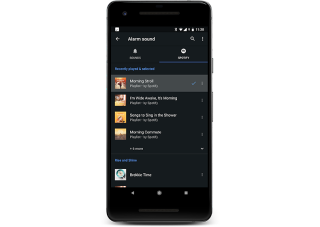 Google’s Clock app can now wake you up with Spotify songs | What Hi-Fi? Both free and Premium Spotify users with Android smartphones can benefit. Bored of waking up to chimes, birdsong or that one track you’ve carried on your phone over the years? Own an Android smartphone? If the answer to both is ‘yes’, you’ll be pleased to know you now have the choice of over 35 million songs to rouse you. Spotify and Google have partnered to allow both free and Premium Spotify users (with Android handsets) to set their alarms with music from Spotify’s catalogue. The integration is due to roll out to all Android users over the next few days, and the functionality will be accessible in a new tab in your Google Clock. Premium subscribers can search and select any track, album, artist or playlist from Spotify, while users of the music service’s free tier are at the mercy of 'shuffle' mode. Once you turn off the alarm you’ll have the option to continue playback, too. Oddly, Google hasn't expanded this functionality to include its YouTube Music or Google Play Music services.